Twelve days (and counting, more on that later) is long time to look for somebody. When you search that long, they stop being “the subject” and start being referred to by their first and last name. These “named” searches are the ones SAR members remember, and speak about for years to come. Steven Ebey, Heather Thomas, David Koch, and now Tyler Wright. Starting on Wednesday, August 18th, SAR members started looking for a lost hiker between Squamish and Coquitlam who was reported to be hiking a route known as the Boise Valley Trail, or Fool’s Gold Route. The missing person’s name was Tyler Wright. Tyler had hiked into the area with a friend; they had spent part of the day together, and the friend had turned back. He had made his intentions known; he wanted to travel the Boise Valley and the Fool’s Gold Route. He had 5 days of food, water, a purifier, some shelter. He did not carry a map or a compass. 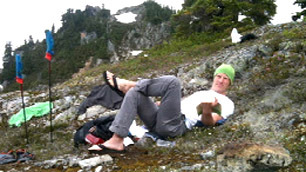 Since the hiker was reported lost, and his last known position was in Squamish, Squamish SAR took the lead. SAR members flew the route and quickly determined that the area was massive, rugged, and remote. For an area so close to a major Canadian city, there were few roads. Tyler had been out for 8 days total when the search started. Reports from hikers who had completed the route indicated that 5 days was enough time, but for a solo hiker with no map and compass in this terrain it would be highly unlikely that they would not get lost. These facts conspired to create a search area hundreds of square kilometers in size. My part of the task began on Thursday, August 19th when I led the first team to hike the start of the trail from the logging landing at Mamquam Pass to the position of the following photo. The snow in the picture was long gone, but from the position of the rocks and boulders in the area we could determine exactly where the photographer stood, and where Tyler was lying. We noted that there was no trace that anyone had been there; no hiking pole marks, no tracks, no scuffs. No indication of direction of travel, only a cairn. 8 days was enough time to completely traces of his passage. The rest of the day (approximately 8 hours) we scoured the alpine areas to the east and west, following the ridge line. With binoculars we looked north and south. Nothing but animal tracks, and nothing moving but a goat. My second day on the search was Saturday, August 21st. Coquitlam SAR was asked to run the search from the south, where the trip would end, and we set up command at Grant Narrows which let us run boats and helicopters. SAR members had been flown to the Pitt Lake drainage the previous evening and were driving the roads at the east end of the Boise Valley, where there was an easy escape from the route. My first task was to put up a portable repeater so field teams could communicate back to base. Hampered by weather, we managed to find a site that would work. My second task was to search a pass between the upper Bull Canyon area and the Coquitlam River drainage. The unnamed lake in the pass became known as “lake 882” for it’s elevation at 882 meters. This pass was chosen because it was obvious that a person travelling south along Bull Creek would see a distinct, low pass, and could easily mistake it for the main route (which was higher, and slightly to the east). To give a picture of the problems encountered on this search, my simple task to search this area was made much more difficult by wind gusting through the pass that prevented our pilot from dropping us off anywhere near the lake. We were dropped instead close to the main route in what became known as Landing Zone (LZ) 8, and made our way to the pass in a two hour hike through cliff bands, steep talus, and very thick bush. Arriving at the search area, we “cut for sign,” meaning we carefully walked the bush and lake edges looking for telltale tracks, and other signs of the passage of a human being. The pass is a natural choke point, and any person travelling through the area would be forced to walk through an area less than 100m wide. Needless to say, we saw no such sign; no pole marks, scrapes, torn or crushed leaves, or tracks in the abundant mud, duff and moss. Any sign we saw was definitely animal in mature. My third day on the search was different; after an early flight to see if we could put up the repeater and to scout some hover-exit spots in the upper Widgeon Creek area, I became LZ coordinator for the Grant Narrows command. What started with one helicopter became three as it became apparent that the low-lying cloud (1400′) would prevent teams from being flown very far. Talon’s AS-350B C-FTHZ, RCMP’s AS-350B3 “Air 5”, and Blackcomb’s Bell 407 C-FCPH all made an appearance (loaded with SAR teams and gear) throughout the day. We also made use of the Coquitlam SAR and Surrey SAR boats, and the Ridge Meadows SAR Hovercraft as well as 4x4s in the upper Pitt Valley. I did not rejoin the search for a fourth day until the next weekend, Saturday August 28th. As the week passed, and stories and images from the search surfaced, one thing was clear; this was rugged, remote terrain. The weather didn’t cooperate, and communication was difficult. Many times teams were put into the field with no guarantee of pick-up at the end of the day, with intermittent radio communications. Squamish SAR had put some resources into acquiring several SPOT devices, which offered a last line of communication where a SAR member could signal for pickup by using the device’s ability to transmit the position and a short text message via satellite. As Saturday rolled around, almost every SAR member in the lower mainland from Pemberton to hope had been asked to contribute to the effort. Expert trackers had been flown in from Vancouver Island, dog handlers from the RCMP and other agencies, and upwards of 4 helicopters (including one hired by the family). Tracks had moved the LKP to the mid Bull Creek area, north of the passes to DeBeck and Coquitlam River, but south of Boise. This seemed to confine the search area somewhat, but there was still the possibility that Tyler had climbed into the alpine, and left the search area. Thank you for blogging about your other job. While it's really sad, it's fascinating to see behind the scenes. Good to know that you guys are there should the sht hit the fan. 1 Pings/Trackbacks for "SAR Days 50 through 60: Tyler Wright search, Boise Valley/Fools Gold Route"